With a bluesy, danceable southern rock sound, the distinctive trio from Texas achieve their biggest commercial success with Eliminator. Gimme All Your Lovin, Sharp Dressed Man, and Legs follow the same winning formula, mixing twangy metal with a dare-you-not-to-dance mid-tempo beat and a deep south ethos to great effect. All three were justifiable and deserved mainstream hits, giving ZZ Top world-wide fame eight albums and 14 years into their career. Eliminator coincided with MTV's rise and the emergence of music videos as a powerful music marketing tool. ZZ Top seized on the phenomenon and capitalized on their image (long beards except for Frank Beard, dark shades, big flashy cool white guys, gleaming red car) to turbo-charge Eliminator's success. Musically, the album fails to support the three hits. The eight other tracks don't ignite, and are generally forgettable and more indicative of the rest of the band's career. 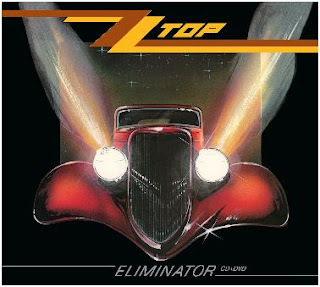 It's harsh, but Eliminator, with 10 million in sales, proved to be the exception rather than the rule; ZZ Top never came close to repeating its success, with the follow-up Afterburner (1985) selling well but moving only half as many copies, and the next album Recycler (1990) proving that the game really was up with 1 million albums sold. ZZ Top have had a long and enjoyable career playing their brand of metal, and are a particularly unique success story due to their stable line-up over 40 years. For a year or two in the mid 1980s, they also stood proud and Texas tall near the top of the music heap. Produced by Bill Ham. Engineered by Terry Manning and Bob Ludwig.